Last year on the 4th I boosted Ana Mardoll’s brilliant book Poison Kiss and since its sequel is one of my absolute favorite 2017 reads, I thought it was only appropriate to boost it on the same day. Survival Rout is the second of Ana Mardoll’s Earthside books, a series of queer polyamorous fantasy romances about super dark fairies. That being said, it’s not a direct sequel to Poison Kiss. I mean, it is, but it’s not. The story focuses on a different set of characters and a different creepy fairy, but it’s still firmly set in the same world and the stories do intersect with characters we know from Poison Kiss turning up as secondary characters in this story. The main characters in Survival Rout, Aniyah, Keoki and Miyuki, are kidnapped from a bar and wake up, memories wiped, in a sadistic fighting arena were different humans are imbued with magical powers and made to fight each other. To put it briefly (because its quite late), things are awful, but tentative alliances are made and a daring escape ensues. 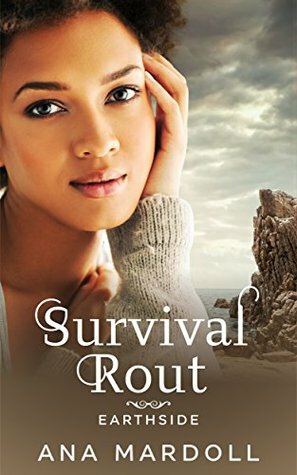 Like Poison Kiss, Survival Rout features a diverse, well-written and (with obvious exceptions) utterly charming cast, beautiful prose and, like, about a million moments that made me tear up. You can read my Goodreads review of it from just after I finished it here. Where Poison Kiss focused quite heavily on mental health issues and depression, Survival Rout dealt with chronic pain (Aniyah has scoliosis) and non-binary gender identity (Miyuki is a demigirl), and does so very well (it’s also #ownvoices). Here’s the thing. I loved Poison Kiss. But I loved, loved, loved Survival Rout! It had all the things that made the first book great, but I just connected even more with the characters in this one, not to mention that the form of polyamory presented just resonated with me a lot more, with there being more of a network of romantic and sexual connections, compared to the closed triad in Poison Kiss). It is an amazing book. Go read it. Ana Mardoll is a queer, non-binary, disabled writer and one of my top recommended people to follow on Twitter (@AnaMardoll!). I recently became xer patron on Patreon, which honestly is one of my better decisions this year. The short fiction xe writes for her patrons honestly just makes me cry every damned time, it’s so beautiful and touching. So you should totally also patron xer if that’s your jam. God, this blog post is way shorter and stiffer than I had intended but uuuugh so tired need sleep. So yeah. I love Survival Rout. Go read it. Good night. This entry was posted in Adventboost and tagged adventboost, adventboost 2017, ana mardoll, earthside, survival rout by Emma Lindhagen. Bookmark the permalink.